A classic Anglo-Indian soup, the name of which means "pepper water," should be richly endowed with meat and piquantly spiced, Mulligatawny became popular with the British stationed in India during colonial times of the late 18th century and later. When they returned home, they brought the recipe back with them to England and other members of the Commonwealth, especially Australia. 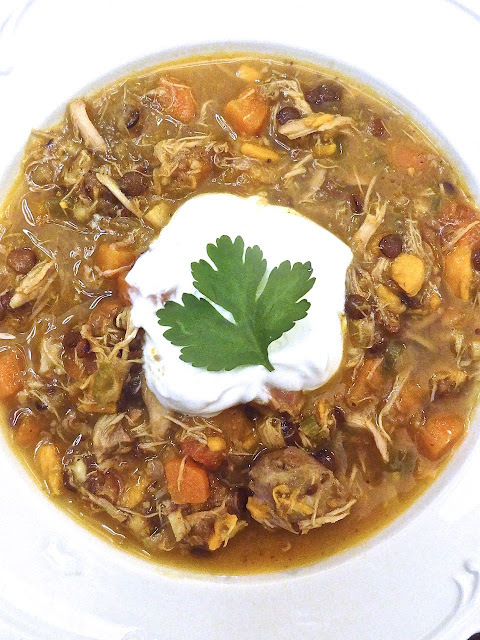 The recipe for mulligatawny has varied greatly over the years and there is no single original version, but is usually based on a chicken stock and curry, with cream, chicken, onion, celery, apples and almonds and garnished with rice. This recipe by Sydney Oland starts with toasting mustard, cumin and coriander seeds in a small pan over high heat until the spices become toasted and wonderfully fragrant, about 3 minutes. Transferred to a mortar and pestle and ground until fine, it also features fresh ginger, garlic, sweet potato, tomato and green lentils for a bright, richly flavoured and satisfying soup, perfect on a cold winter day. Preheat oven to 375°F. Season the chicken thighs with salt and black pepper and roast until cooked through, about 25 minutes, then transfer to a plate and reserve. Add the vegetable oil to a large pot and once hot, add the onion, carrot, and celery and cook, stirring often until onions are translucent, about 5 minutes. Add the curry powder and toasted spices and stir until the vegetables are evenly covered. Add the garlic, ginger, sweet potato, apple and plum tomato and stir to coat. Add the lentils then return the baked chicken thighs to the pot. Add the broth and bring to a simmer, then cover and cook until the potatoes and lentils are soft and soup has thickened, about 1 hour.